I recently told a room full of academics interested in using videogames as a teaching tool that “to play is the biggest freedom we can have as a child, or as an adult”. The popular world-building game, Minecraft, provides that opportunity at every twist and turn – something Microsoft has emphasised when announcing the release of Minecraft Education Edition. After buying Minecraft in 2014, Microsoft also recently acquired MinecraftEDU, a modified version of Minecraft developed by Teacher Gaming to help teachers use it more easily in the classroom. The latest edition will make this even easier – but what makes this game such a great tool for teachers? Minecraft is a creative “sandbox” game where the players dig up blocks in a landscape, craft them in to new materials, then use them to create whatever they wish. It allows players complete freedom to explore, build and experiment and is often referred to as “virtual Lego”. The key to success in the classroom, as any good teacher will tell you, is keeping students engaged. Motivated and enthused teachers are more likely to motivate and enthuse their pupils, who in turn are more receptive and willing to explore, experiment, test and – most importantly – fail, as part of the learning process. In a recent archaeology undergraduate class, we explored the site of the deserted medieval village of Wharrem Percy in East Yorkshire. 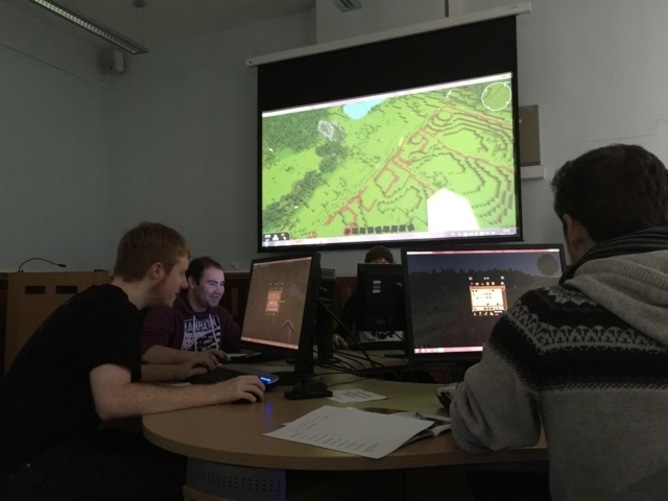 We did so without leaving the classroom – we recreated in MinecraftEDU using shuttle radar topography mission data available from space shuttle missions, combined with DEM software for viewing 3D models to create a 1:1 scale map of the region, imported into Minecraft using WorldPainter. From there, landscape detail including ruins, ponds, rivers and forests can easily be added in. The archaeology students were given a map of the earthworks and a set of artists’ impressions of what might have stood on the Wharrem Percy site throughout the medieval period, taken from their textbooks. Using their knowledge of the site and their academic resources, they set out to recreate the site, while reflecting on the limitations that come with working with 1m3 blocks throughout. We had two levels of student in the group, those with experience of working with Minecraft and those without. The 18-year-olds of today have grown up with Minecraft as part of their childhood – given there have been more than 22m downloads of the game we can certainly expect some students to arrive with some understanding of how it works, either firsthand or via family or friends. This exposure makes for a very shallow learning curve for most people, so they can quickly get into the game and get creative. After initial orientation exercises for newbies, they were off visualising and building their ideas. Using real data to create real environments in the virtual world? For many learners it doesn’t get much more engaging than that. It’s the start of a conversation that can lead to many opportunities to dig deeper into the source material and make connections. With primary school children we can talk about shuttle missions, satellites, mapping, geography and how we see our world from space. For the secondary school pupils we can talk about datasets, using software to manipulate data, and geographical features and how they originated, as well as the technical challenge of creating something from raw data. Minecraft has the potential to kickstart conversations and different ways of approaching the process of teaching and learning on so many levels, and in a language that is appropriate to the student’s level. The archaeology students had, from a site of empty earthworks, built several smallholdings complete with cultivated fields of crops in just a couple of hours. We asked students to reflect on their building materials, techniques and other choices they’d made, and gathered these reflections through a simple form which the students completed during the process. Looking at these, it is clear that using Minecraft certainly encouraged them to think about and discuss how the Medieval buildings were originally constructed and what were appropriate materials for the period. So what makes Minecraft a great learning tool? Creativity, freedom to explore and experiment. It encourages attempts and failure in a safe environment and opens up conversations with students on their understanding of the subject. Overall, by allowing us to play and rediscover the freedom we had as children, it sets us free.